The hottest zip codes list has been released by Realtor.com and once again, a Michigan city makes the top-10. Kensington, on the west side of the state, received the top overall rate. That said, metro Detroit has it’s own areas that are starting to heat up and inch closer towards the list including: Ferndale, Southfield (48076) and Livonia (63143). “By that, I mean homes are selling quickly and they’re getting a lot of buyer interest,” said Danielle Hale, the chief economist at Realtor.com. That’s important because it means homes are selling faster than ever in some spots. In the same time an average U.S. home sells, three sell in Ferndale. 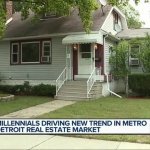 Hale pointed towards Ferndale’s relatively cheap median costs compared to other Oakland County locales as to why homes are selling quickly, but she noted that millennials are specifically driving the ship when it comes to houses disappearing off the market. The data they’ve collected shows that 36 percent of homes sold in Ferndale are bought by millennials, which is higher than usual.